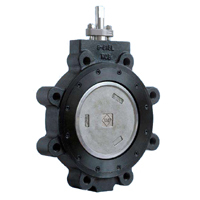 A butterfly valve is a valve used for flow regulation in which the disc takes the form of disk. Operation is similar to that of a ball valve. A plate or disc is positioned in the center of the pipe. The disc has a rod passing through it that is connected to an actuator on the outside of the valve. Rotating the actuator turns the disc either parallel or perpendicular to the flow. Unlike a ball valve, the disc is always present within the flow, therefore a pressure drop is always induced in the flow, regardless of valve position.